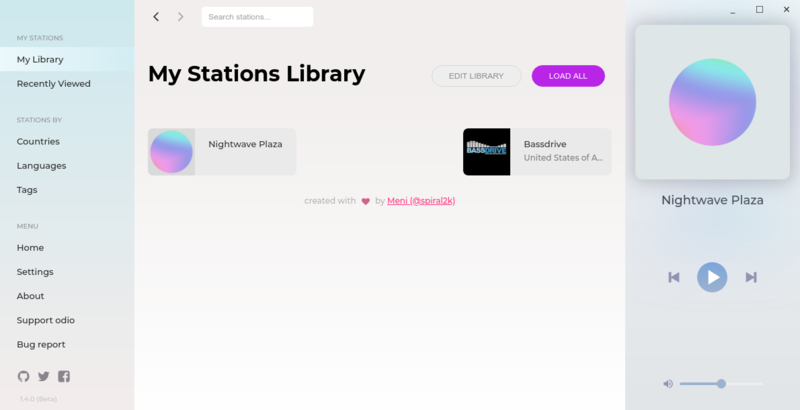 If you don't use Spotify, Google Music or Pandora but prefer traditional internet radio stations...meet Odio. On the surface Odio is reminiscent of iTunes and features smooth animations with very nice design. In this mini review I'm running Odio on an installation of Void Linux using the official Odio Appimage available on the project's Github page. I'll take a quick look at the app's settings, main features and comment on the overall experience. Without further delay, I'll start what I consider the main features of Odio. Upon opening Odio you are greeted with a cleanly designed interface. 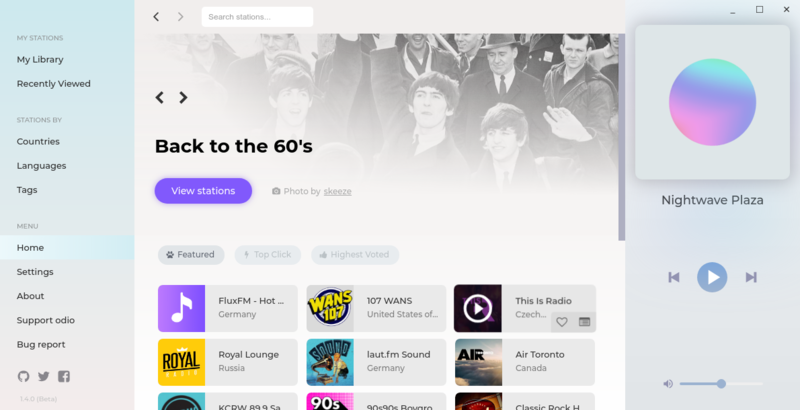 By default, you are started off in the “home” category on the side bar which displays a selection of featured, top clicked and highest voted stations. Clicking around some more, you will start to notice just how snappy Odio is. Even when clicking around like a person who's gone mad, it just doesn't seem to phase Odio one bit (with the exception of the tags category). On the right portion of the window is the built in audio player which has simple controls for volume, skipping forward as well as play/pause. As I mentioned above earlier, the interface is very much like what itunes users are used to. 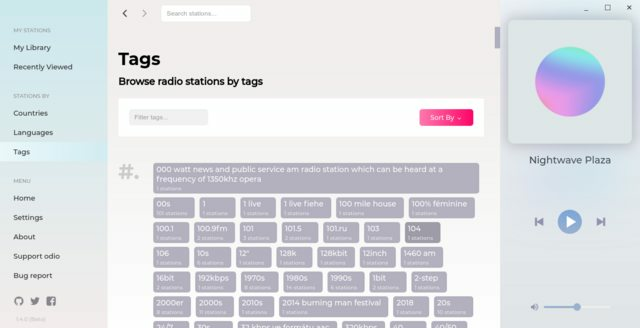 For those of you who are familar with similar projects such as Gradio, you may also be familiar with the open source radio catelog service called Radio Browser which provides an API that application developers can incorporate into their software. Odio, like other projects makes use of this service which means if you are satisfied with the station selection available through Gradio, you'll have the same level of access with Odio. At the time of this writing, Radio Browser has 22730 stations. One of the most valuable features that I hope to see in apps like Odio is the ability to find stations by tag. In Odio, tags are located directly on the side bar and intuitive to filter. Just enter in your search term and Odio sorts through the results super quickly. Honestly I expected at least a tiny bit of lag as I began typing but I go to hand it to the Odio team since they really did a great job with optimization. There are a lot of good things to say about Odio however the settings leave much to be desired. Currently the only option available via the settings section is the theme (dark or light), which is probably the best single option I'd ask for since the default light theme is almost too much for me. Hopefully some more settings options are on the roadmap. If you are looking for a responsive, beautiful and modern internet radio player with thousands of stations then Odio is certainly worth checking out. While I haven't tested Odio on Windows or Mac, I can see that the Odio team are very capable and good at making a stable and tested piece of software that works as expected.